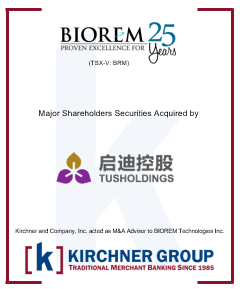 Kirchner Group is pleased to announce that it acted as the M&A advisor on BIOREM Technologies Inc.’s majority shareholders’ divestiture to TUS Holdings Co. Ltd.
BIOREM is a leading clean technology company that designs, manufactures and distributes a comprehensive line of high-efficiency air emissions control systems used to eliminate odors, volatile organic compounds and hazardous air pollutants. As outlined in the company’s press release, TUS will bring it greater access to the Chinese market, one of the largest international opportunities for companies operating in the environmental sector. “Kirchner was instrumental in the collaborative resolutions to issues that arose throughout the process and relentless in advancing the deal forward to a successful close,” commented Bernardo Llovera, General Partner of Expansion Capital. Kirchner Group was founded in 1985 on two fundamental premises: every business can be improved and every business should improve the world. Today, the firm is a values-based corporate ecosystem, committed to the integration of “earning and returning”.